The Baryonyx is a carnivore and is known to have eaten fish as well as other dinosaurs. This killing machine's name means heavy claw and its fossils have been found in England and Spain (the first fossil was found by William Walker in 1983). It lived in the lower cretaceous period between 98 and 144 million years ago. 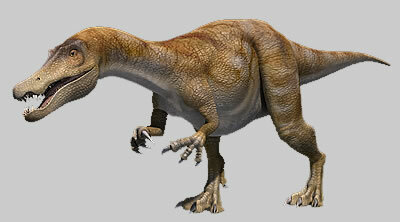 Baryonyx was about 8.2m long, 3m tall and probably weighed about 2000kg (2 tonnes). It had a long neck that supported its skull with a long jaw and many teeth. It also had a long tail which helped it to balance. The size and shape of the Baryonyx's back legs suggest it would have been a fast runner. It had 96 sharp teeth and 30cm long claws on its hands. Baryonyx's teeth were very unusual for dinosaurs - the cutting edges were much finer. This would have meant they would have been better at holding prey in place than tearing flesh. Baryonyx was the first meat-eating dinosaur to be discovered in England and the first fish-eating dinosaur to be discovered anywhere. you taught me something new. That the baryonic eat fish.